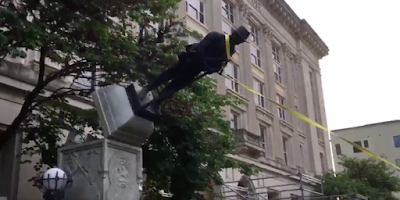 Confederate statue in Durham torn down; image from here. At the top of this week, the Washington Post published this piece by Valerie Strauss: The first thing teachers should do when school starts is talk about hatred in America. Here’s help. Update: another good link: There is No Apolitical Classroom: Resources for Teaching in These Times via the National Council of Teachers of English. Those links contain more links to resources, readings, and lesson plans, and may be a good place to start for educators who know that current events matter, and that not talking about Charlottesville makes a statement to your students that's just as loud as any conversation or critical exploration. In that spirit, and because my background is in using spoken word as a tool for narrative-building and opening up spaces for authentic dialogue, I wanted to share a few poems that have been on my mind lately. As always, list-making is tricky. This is not a list of the "best" poems about this topic; it's a list of poems that might be useful for educators looking for artistic work that can prompt some critical thinking about hate, white supremacy, and the recent events in Charlottesville.